A Scout is Loyal. A Scout is true to his family, friends, Scout leaders, school, and nation. A Scout is Helpful. A Scout cares about other people. He willingly volunteers to help others without expecting payment or reward. A Scout is Courteous. 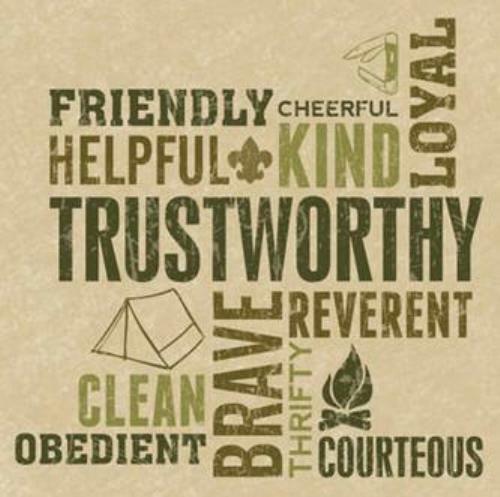 A Scout is polite to everyone regardless of age or position. He knows that using good manners makes it easier for people to get along. A Scout is Kind. A Scout knows there is strength in being gentle. He treats others as he wants to be treated. Without good reason, he does not harm or kill any living thing. A Scout is Obedient. A Scout follows the rules of his family, school, and troop. He obeys the laws of his community and country. If he thinks these rules and laws are unfair, he tries to have them changed in an orderly manner rather than disobeying them. A Scout is Cheerful. A Scout looks for the bright side of life. He cheerfully does tasks that come his way. He tries to make others happy. A Scout is Thrifty. A Scout works to pay his own way and to help others. He saves for the future. He protects and conserves natural resources. He carefully uses time and property. A Scout is Brave. A Scout can face danger although he is afraid. He has the courage to stand for what he thinks is right even if others laugh at him or threaten him. A Scout is Clean. A Scout keeps his body and mind fit and clean. He chooses the company of those who live by high standards. He helps keep his home and community clean. A Scout is Reverent. A Scout is reverent toward God. He is faithful in his religious duties. He respects the beliefs of others.